Slater's Funeral Home was founded in 1911 by one of Milledgeville, Georgia's own sons, Mr. Alonzo Slater. He was a contractor, builder, and once served as a page in the Georgia State Legislative Assembly. Upon Mr. Slater's death in 1955, his widow Mrs. Essie Slater along with their son Richard, JR continued to operate the family's business - Slater's Funeral Home. After fifty-five years of establishing Slater's Funeral Home as a landmark for funeral service in the Milledgeville community, at the death of Mrs. Essie Slater (September 27, 1966) the funeral home closed its' doors. Immediately realizing the need for the caliber of funeral service established by the Slater family, on November 15, 1966, a local high school principal, Mr. Joseph M Graham and local businesspersons, Mr. & Mrs. Floyd L. and Ruth Evans Griffin, SR reopened the now, Slater's Funeral Home, Incorporated. The new owners worked tirelessly to expand and launch their business in the traditions of the funeral service industry. Also, their goal was to continue to provide compassionate and dignified funeral services to the all of their clients. In 1969, Mr. Joseph M. Graham passed away. Mr. and Mrs. Griffin, now licensed Funeral Directors became the sole owners of Slater's Funeral Home, Inc. On January 22, 2005, Mr. Floyd L. Griffin, SR entered into rest and five years later, on the 28th of July, 2010, Mrs. Ruth Evans Griffin also entered into rest. The Griffin's demise left a legacy that underlined their willingness to provide the highest quality of funeral service to persons in every walk of life. Their legacy upheld the traditions of the funeral industry bonded with the illustrious past of Slater's Funeral Home. The Griffin's legacy highlighted their resolve to seek up-to-date and improved techniques and practices in the funeral industry, while meeting the demands of an ever changing world. The torch was passed to the Griffin children. The Honorable Floyd L. Griffin, Jr. served as President, Funeral Director, and Embalmer and Mrs. Delbra Griffin-Waller served as Vice-President, Secretary, Treasurer, and Funeral Director of Slater's Funeral Home, Incorporation until 2017. 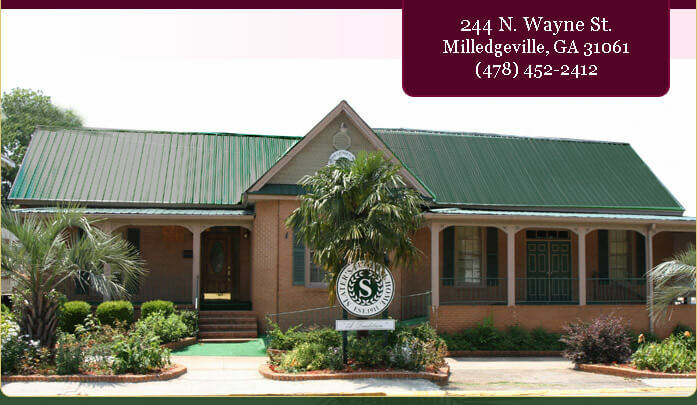 Slater Funeral Home, Inc. celebrated 100 years (1911-2011) as a recognized landmark for funeral service in the Milledgeville community. For years, members of the community inherently knew that the best of care and attention to details for their loved ones' final arrangements were within the opened doors of Slater's Funeral Home, Inc. The Honorable Floyd L. Griffin, Jr. and Mrs. Delbra Griffin-Waller will continued to uphold the torch passed them never forgetting every morsel of sacrifice of their parents and the founders, honoring traditions, and engaging in the resource of the funeral industry to let the community know how much Slater's Funeral Home, Inc cares for each families. As of 2017, Slater’s Funeral Home is under the servant leadership of Mr. Andre Jenkins. Mr. Jenkins comes to Slater’s funeral with multiple years of funeral service and leadership. It is his will to continue the legacy of Slater’s Funeral Home by consistently serving families in Baldwin and surrounding counties.